My goal is $90k by the end of year, I am starting to think I might actually hit that goal. This graph is pretty fun, bare in mind that I'm making about $25,000 annually right now, highest income in past 2 years was $3,750/month gross for 3 months last year. Welcome JuicyCrab! Man, you have picked up the pace month over month. Nice job! When all seems grim the MMM forums give a lot of financial support (both application and mentally), these types of threads are awesome. Can't believe how many graduations there were this month! Can't wait to join you guys in the next thread, it's really motivating seeing everyone's progress. Little less progress than I had hoped this month considering I had a large tax return coming in. Months ago I foolishly invested in a fairly volatile ETF that took a hard hit this month. Oops. So close... 97 582 ...Company bonus next week should put me way over 100 000 ..
Well i guess i am leaving you guys this month ... 107,528.61 . Hello Mustachians, This is my first post. I discovered Mr. Money Mustache in Jan 2017 and the blog slapped some common sense into me. Here are my numbers, I started keeping records in January. Only tracking 401k and cash, no properties yet. Congrats to everyone who is here and those who recently graduated. That is great, MVal!!! As a mustachian it is hard to know how to celebrate such things, ha ha. At the very least you can post it here and know that your fellow mustachians are celebrating with you. Thanks!! I graduated at the very end of last month! Here's a little start to the celebration and maybe an anthem for those still "tryin' to get 100"...! I wonder if I can hit 10x NW at the 2 year mark. That'd be 53270, so +3624 in 2 months. It'll be a stretch, but maybe a fun challenge! An increase of 4,566 for the month of June, another solid month . This increase was once again driven by a good amount of overtime, and I am actually hoping it will slow down a bit over the summer months. Besides that, expenses were on the high side but pretty standard for the month. Investments were up a bit, due to my company shares doing well. I hate having one company as a large percentage of my investment portfolio, so I just have to determine the best way to get them into etfs, in registered accounts. I'm thinking the only way is to sell, eat the capital gains, then rebuy VCN, XAW in my registered accounts. Any thoughts or input on this idea would be greatly appreciated. Holy smokes, what a great month June was! I got a bonus check of about $1,400 this month and an extra $200 in deposits from my renters. But outside of that $1,600 I would attribute the rest to my typical savings rate of about $1,200 and market increase. July will be another big month because of my company's 401k contribution but outside of that I don't expect to see anymore large bumps like this until my December bonus. Had a great month. Upped my 401k by a couple percentage points, paid down a couple grand in student loans and the company I work for gave out some nice equity to the employees. Going to keep chugging along, hopefully I can keep these gains up! A great progress month ($11,015), lots of overtime accounts for going way above my expected savings. Riding my bike everywhere now (if I don't walk). Cutting spending wherever I can. Still a slow strategy/ mind-shift. Switching to RRSP savings in July (from TFSA weekly) to lower tax burden in good year. This was a slower month thanks to the purchase of flights for a reunion and airbnb (that will be split). Should see a slight surge in August when i get repaid for the airbnb. Second post on this wonderful forum - woohoo! Slid backwards a bit this month. A little too much spending and some more losses on the market again this month. Fingers crossed for a better July. I'm one of the slower earners here, but I admit I'm pretty excited by the 50k milestone! Congrats on the milestone FreshStash! Nicely done. June was a frugal month and I took advantage of the '3-paychecks month'. June 30 stash was ~$93k. July will be a slow month. hey i'd like to join =) do we still use the spreadsheet on OP ? can i just plop myself in there? 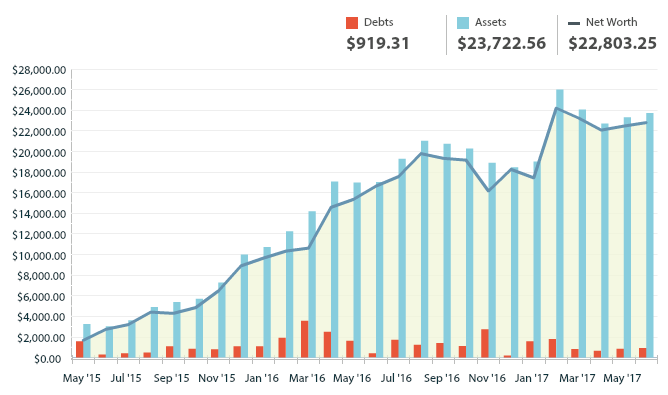 Finished the first half the year above $50K. Halfway to $100K! Wow! 30k in 6 months... That is amazing! Belated welcome to you Nairobi! You also will not be with us long, looks like. Great job! Beantown and 70times7 -- you are both killing it. Wow -- very nice progress! Had unexpected dental bills in June. Given the historical trend this year, it'll be tight getting to 100k on Sept 1. It may be plus or minus a few hundred dollars. Sounds like a good excuse for strategic frugality. Thank you Trifele! I originally predicted to hit 100k at the end of September but I was being conservative. I did not account for market gain, employer match to 401k, or overtime. I decided to chase FI due to unstable job. However, I'm glad the job is unstable because that uncomfortable feeling continues to be a great motivator for me. Congrats to everyone and I look forward to seeing more graduates soon. Long time lurker who's just signed up, so this is actually my first post. Welcome to the forum and the thread Icbatbh! You're among fine people here, all building the foundation for their 'stache. Sweet update, Senor P. Great progress, plus nice that you've kept such good records. 7/1/2017 $100,056 After exactly 36 months, I have finally gone from -$5,000 to just barely squeeze past $100,000!!! Off to the $250K thread, good luck to everyone here, and hopefully see you again soon! Ding ding ding!!! Woo hoo and congrats Bart1!! Huge, huge accomplishment. Come on up to the next level guys. Your heads are above water now and you can see your future. Awesome job. I'm moving slowly - slower than planned due to medical expenses which are unfortunately ongoing. I haven't included my pension savings and they're also slowly improving. I'll get to that 100K goal one day! Yes, you will Zinny! I started way in the hole and clawed my way into positive NW, then slowly built up the stache. Now I'm in the $500k - $1M thread. The bigger the stache gets, the faster it goes. Don't let the challenges get you down. You've got this!